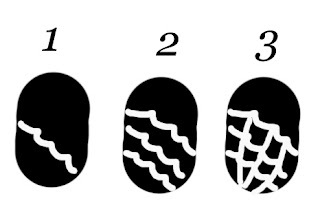 Need some ideas to get awesome Halloween nails in a hurry? After reading up on the subject myself, and trying a few things out, I've come up with some time saving tips to get great Halloween nails! On the pinky I've got a cute Candy Corn design! Easy to do with just three colours. Done! Looks great, but if you don't have matte orange, yellow, and white, you're out of luck. On the thumb I've got black and orange as a base and Sally Hansen's Crackle nail polish in Fractured Foil. Looks great, but what if you don't have the crackle polish? You can easily do any of the three designs on my index, middle, and ring finger provided you have any light colour to use as a base, and ... a Sharpie! First, paint your nails in your chosen base colour. Apply clear coat, and wait til dry. Thoroughly. Using a good quality permanent marker like a Sharpie, draw your design being very gentle and only barely touching the surface of the nail with the marker. If the marker seems to skip along the surface, or is streaky, you are pressing too hard. Tip: Ask a friend to do your dominant hand for you. You can see how to do the skull and spider web at Lipgloss and Black's blog. They are a Toronto based indie fashion house with awesomely dark but modern clothes. Check out their blog to see an alternate way of doing the spider web. Drawing the spider web is easy, just make kindergarten waves! Start with the curved lines, making what looks like the way a kindergartener would draw waves in the water if asked to. Join each wave line together with a straight line going through the points of each. Once you're done drawing your design, be sure to wait several hours before applying topcoat. When you do, use as few strokes of the brush as possible, as it's easy to get streaks of black on the white. If this happens no worries, you can just touch it up with your white nail polish on a toothpick. Clean up any nail polish from your cuticles with a cotton swab and some remover, and you're good to go to the Halloween party! What do you think? My favourite is the Candy Corn nails, but I hate the candies!